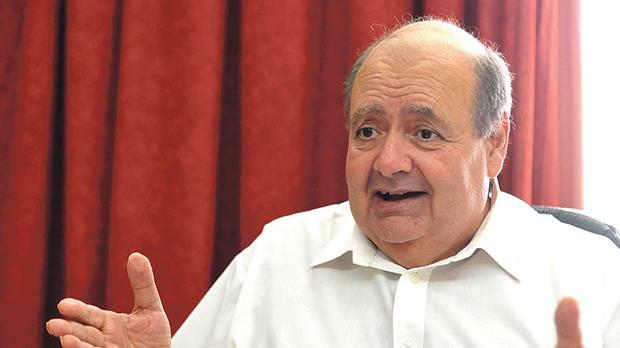 The Equality Minister has condemned “disparaging comments” by Tony Zarb, who called the women holding a protest at Castille Place traitors and compared them to prostitutes. 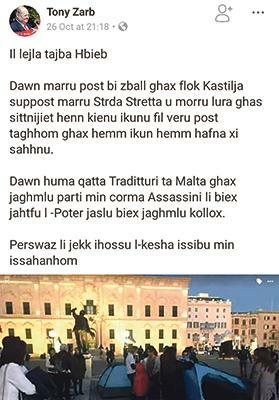 Mr Zarb’s Facebook post calling the women protesting at Castille traitors and comparing them to prostitutes. Mr Zarb removed his post yesterday and apologised to “genuine women” irked by his comments. The Equality Minister’s spokeswoman said Helena Dalli “disagrees with his statement, as she disagrees with any disparaging comments”. Asked if Dr Dalli condemned the statement, the spokeswoman said that she did. Meanwhile, in reaction to Mr Zarb’s comments, lawyer Roberta Lepre referred to Article 82A of the Criminal Code, which states that whoever uses threatening, abusive or insulting words or behaviour, displays written or printed material of this nature or conducts himself in such a manner as to stir up violence or racial or religious hatred based on gender or opinion, among other grounds, may be liable to between six to 18 months’ imprisonment. “Here's reminding Mr Zarb about a certain section of our Criminal Code,” the former director of Victim Support Malta said on Facebook. The Women's Rights Foundation later announced a police complaint had been filed against Mr Zarb. Human rights NGO Aditus Foundation offered pro bono support to anyone who felt aggrieved by Mr Zarb's comments, noting that “in a civilised democracy, an equality minister or body would lambast these comments and reiterate an unequivocal zero tolerance to such rubbish”. Director Neil Falzon said the women gathered in Castille were the directly injured parties and they could file a report with the National Commission for the Promotion of Equality, because being referred to as a prostitute could qualify as harassment. Aditus Foundation is also willing to support those who file a criminal complaint with the police on the grounds that Mr Zarb’s comments may amount to hate speech. As Mr Zarb’s comments were shared across social media, some suggested taking class action, with one lawyer telling this newspaper the statement went beyond the women physically present at Castille Place and extended to others who endorsed or supported the #OccupyJustice cause. The Nationalist Party called on the government to condemn and distance itself from Mr Zarb's comments. This was not an attempt to silence Mr Zarb, who should continue benefiting from his right to freedom of expression, the party said.